Recognized as one of the “Top 50 National Universities” by U.S. News & World Report, Villanova University, located in suburban Philadelphia, is home to nearly 11,000 undergraduate and graduate students. For those who are intellectually ambitious, Villanova’s prestigious Honors Program divines a distinctive path of growth and camaraderie through all four years of their undergraduate journey. Incoming students with a strong record of academic achievement and cocurricular leadership are invited to apply to the Honors Program upon their acceptance to the University. A community within a community, the Honors Program allows students to take course work alongside like-minded peers in the Honors Residence Hall, while innovative Honors Learning Cohorts bring together students with similar interests in small seminar-style classes that afford them ample opportunity for discourse and debate with peers and dedicated faculty members. Villanova was founded in 1842 by the Order of St. Augustine, making it the oldest and largest Catholic university in Pennsylvania. St. Augustine believed in a commitment to community and the connection between heart and mind. These beliefs guide Villanova’s educational approach, making the experience not just about outstanding academics, but about each student’s growth as a person. Located on a picturesque 260-acre campus, Villanova attracts high-achieving students of all faiths who are dedicated to social responsibility and volunteerism. 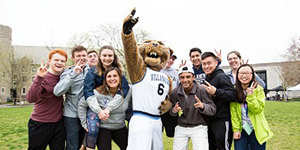 Villanova offers more than 60 rigorous academic programs through four undergraduate colleges: the College of Liberal Arts and Sciences, the Villanova School of Business, the College of Engineering, and the M. Louise Fitzpatrick College of Nursing. Interdisciplinary concentrations are offered in a variety of areas. Love of learning flows through Villanova’s campus, and the joy of ideas, discourse, and discovery are shared widely. Here students find proven scholars—not graduate assistants—at the head of their classes. With an average class size of 22 and a 12:1 student-faculty ratio, students are ensured close interaction with their professors, 90% of whom hold the highest degrees in their fields. Across all the Colleges, research plays a critical role in bringing Villanova close to industries where partnerships and collaborations become an exciting dimension of how the University expands opportunities for faculty and students to work together on significant investigations, groundbreaking discoveries, and powerful innovations. 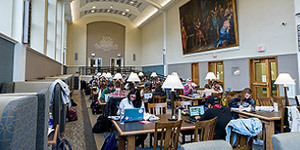 Undergraduate students are encouraged to join research projects with faculty starting their first year, fortified by programs like the Villanova Match Research Program, the Falvey Scholars Award, and the Villanova Undergraduate Research Fellows summer program, which provide funding and support for study and investigation. First-year students are also encouraged to join themed Learning Communities, where they live and learn among friends. Students in these communities live in the same residence halls, take the Augustine and Culture Seminar together, and participate in cocurricular programs like lectures, plays, and trips. Villanova has been recognized as a top producer of Fulbright Scholars by The Chronicle of Higher Education. Since the 2015 academic year, more than 120 Villanovans have earned competitive fellowships, including Goldwater, Marshall, and Fulbright. Villanova is a close-knit and caring community. 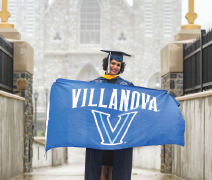 There are more than 260 student organizations and 36 national honor societies at Villanova. Service to others through volunteerism and service learning projects is a fundamental part of the Villanova experience, and Villanovans provide more than 250,000 hours of community service each year. Housing on campus is currently guaranteed for three consecutive years, and 66% of the student population lives on campus. Villanova’s award-winning Dining Services offers a wide variety of options, with 18 eateries—three dining halls and 15 à la carte venues. The Nova Nation fan base is as loyal as it is competitive, and once you’re a Wildcat, you’re always a Wildcat. Nearly 20% of the student body participates in 24 varsity teams and 30 club sports, and approximately 3,200 students participate in 10 intramural sports each year. In 2016 and 2018, the men’s Division I basketball team won the NCAA national championship. The University has also produced more than 60 Olympians in its history, and Villanovans have participated in every Summer Olympics since 1948. At Villanova, the Career Center and the Colleges collaborate to provide students with enriched course work and internship experiences. Innovative career and professional development concepts are integrated into the curriculum of all four Colleges starting as early as the first year. Additionally, more than 19,500 job opportunities were posted on Villanova’s job boards; 96.3% of recent Villanova graduates become full-time employees or enroll in graduate school within six months of graduation; and the average starting salary for Villanova graduates is $59,235.